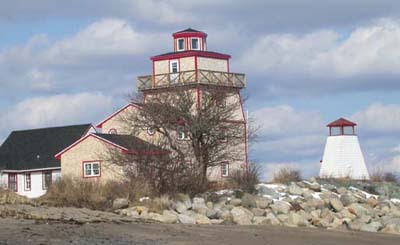 The current lighthouse structure is a combined museum and replica. Fort Point, LaHave River, is one of the most historic places in Nova Scotia. In 1632, a large fort defended by 25 cannon was built on the headland, which reached further out into the ocean in those days, by Isaac de Razilly. He had been appointed Lieutenant Governor for all of New France by King Louis XIII. LaHave was, therefore, the capital of New France until Razilly’s death in 1636. After that, most of the inhabitants went to Port Royal (on the other side of Nova Scotia near Annapolis Royal). The fort was destroyed in 1653 or 1654 by Emmanuel LeBorgne and the ruins have since washed away. 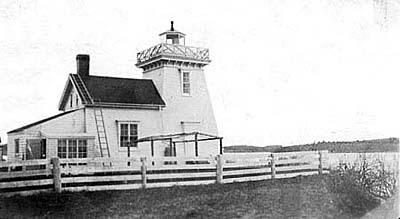 In 1876 the Canadian Government erected a lighthouse with an attached keeper’s dwelling on the point. It served as an aid to navigation for mariners in Dublin Bay and LaHave River until 1954. The red, fixed light was visible all around for eight miles. The lighting apparatus was three flat-wick lamps and one round-wick lamp, all with reflectors. At some time before it was demolished in 1954, the lighthouse was equipped with a refracting lens. The lightkeepers used a hand operated foghorn in thick conditions and received extra pay for answering mariners signals. For over 65 years the keeper and his family lived in the small house, shown above, attached to the lighthouse. In the 1940‘s that house was torn down and a separate keeper’s dwelling was built. The lighthouse was demolished in 1954. It was replaced by a light on a skeleton tower. Photograph courtesy Chris Mills, The skelton tower on Fort Point near the entrance to the LaHave River. The 1940's keeper's house at Fort Point (LaHave River). The double doors are likely a modification of the original house. Fort Point (LaHave River) left to right: former keeper's house, now a museum, shed, addition, small replica of a "pepperpot" type lighthouse. The Fort Point Museum showcases 400 years of local history. It is located on a beautiful property with water on three sides, the LaHave River, Dublin Bay and Lily Pond. 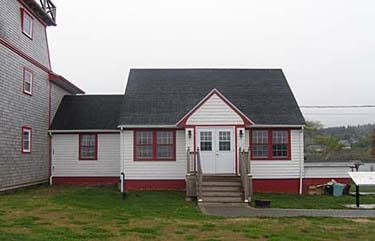 In addition to the museum and lighthouse, the site has a French garden, a Mi'kmaq Village, historical panels, an outdoor stage, a beach, and picnic tables. The museum is open from June to September. Many events are held throughout the season, including a lobster supper at the end of May, the Mi'kmaq Acadian Festival in August and the LaHave River Folk Festival on the Labour Day Weekend. *Please note that there is a Fort Point Lighthouse in the town of Liverpool. You can find out about it on this website. Select “Fort Point Lighthouse (Liverpool)” in the “Pick a Lighthouse” menu. Tower Height: 35 feet high. 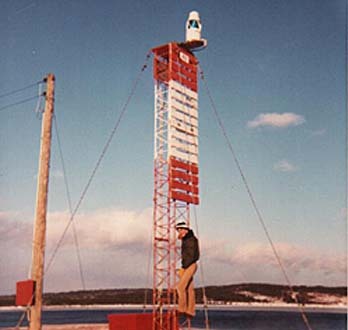 Light Height: 48 feet above water level.